Some Questions Note Holders Ask. Have a few questions? A lot of people do. So, here’s a quick collection of some of the common questions we get from note holders… with our answers next to them. If you still have a question don’t hesitate to shoot us an email through our contact page (or give us a call). Q: Why should I even consider selling my note in CA? Q: Why should I sell my note to Real Estate Group 360? You won’t have to worry about admin tasks like IRS income tax reporting requirements, IRS tax liens against the payor, collecting payments, etc. You won’t have to worry about destruction and devaluation of the property / asset. You won’t have to worry about your note being assumed by another borrower who turns out to be a deadbeat. Q: How do you come up with the price to offer me for my note? A: Ultimately when we look at a note to buy here in California CA or any other state we buy notes in… we look at a few factors. 1) The note: Payment amount, loan terms, # of remaining payments. 2) The asset: A bit about the property or asset backing the note. If it’s a quality asset, the note will be worth more. 3) The borrower: The seasoning on the note, credit profile, etc. With all of that we’ll figure out the value of the note and present an offer that’s a discount on that value. Once we know the situation well, we’ll make you an offer. This offer is based off of the value of the note, the risk on us receiving the payments from the borrower, and the quality of the security backing the note (real estate, etc.). You can expect to receive an offer that is a discount on the full remaining payment value based on the factors above. A: There are NO fees or commissions to work with us. 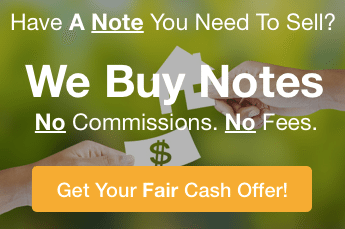 We’re CA based note buyers and we buy and sell notes with cash… we don’t broker notes or charge the note seller any fees or commissions. In fact, you won’t pay any costs at all during the whole process… we pay every cost associated with the transaction. You just get access to the cash trapped in your note without the hassles or costs that goes with working with a note broker to sell your note payments. A: No obligation at all. Once you tell us a bit about your note, we’ll take a look at things, maybe set up a call with you to find out a bit more about the borrower or to confirm some details, and make you a fair cash offer thats fair for you and fair for us. The whole time it’s 100% your decision on whether or not you’d like to sell your note to us. Once you get our offer we encourage you to research it, shop it around if you want to, and ask us any questions you want. No pressures. No hassles.